At one time the image of the Southern “redneck” was viewed as a person poorly clothed, barefoot, lazy and of poor intelligence. Some were thin with large abdomens and poor muscle development. 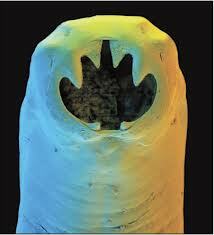 This was the Southern anemia caused by hookworms that enter the body as larvae thru the skin of bare feet. They then enter the blood stream, migrate to the lungs, up the trachea and are swallowed to the digestive system. The parasites feed on our blood. They mate in our intestines and produce thousand of larvae that are passed on thru feces. This was an illness of poor hygiene, clothing and the lack of adequate facilities. In this day and age, little thought is given to human parasites. We are of course diligent about worming our pets. Given their dietary indiscretions, worming our pets is a good idea. So is there any risk to humans? You could be at risk if you have pets, allow them in your home, and/or sleep with them. There is the old saying that “if you lie down with dogs you wake up with fleas” and perhaps other creatures. Another potential risk is eating in restaurants that have workers that do not wash properly. Some workers from the USA or other countries may have poor hygiene habits or contracted parasites from other parts of the world. Other risks include eating poorly cooked meat, especially pork, or eating sushi. At risk recreational activities include swimming in lakes or rivers. Symptoms of parasite problems include itching of personal areas, loss of appetite, hunger without satiety, constipation, protein deficiency, dry skin and hair, insomnia, fatigue, anemia, abdominal discomfort and grinding teeth at night. Keep in mind that parasites consume your nutrition and create waste that your body has to deal with. Stool samples are not always conclusive. You can have a negative stool sample but still have parasites. So if you are at risk or have any of the symptoms listed above you might consider a parasite cleanse. Herbal products include Wormwood, Black Walnut, Fennel seed, Pumpkin seed, Betel Nut, and West Indian Pink root. This combination can be found in Verma Comp. Adding the homepathic combination Verma HP is a great addition.